We are super excited Valentine came earlier for all NaijaBet Users, why wait till February 14th when Valentine is already ongoing with NaijaBet.com, it’s the season of love and we are spreading love to our esteemed users just because #NaijaBetlovesyou. It’s very easy: For every time you make a minimum deposit of N2000 to your NaijaBet account your account gets credited with extra 10% up to N100,000 Free bets credits. For ATM 1& ATM 2, Bank Deposits or Transfer, you will need to input the bonus code NaijaBetlovesyou and make a deposit request to qualify. Start depositing Now! Good day Naijabet. Please how long does this Valentine Promo last. Like what day exactly would it be over. Good day, Thank you for the inquiry. 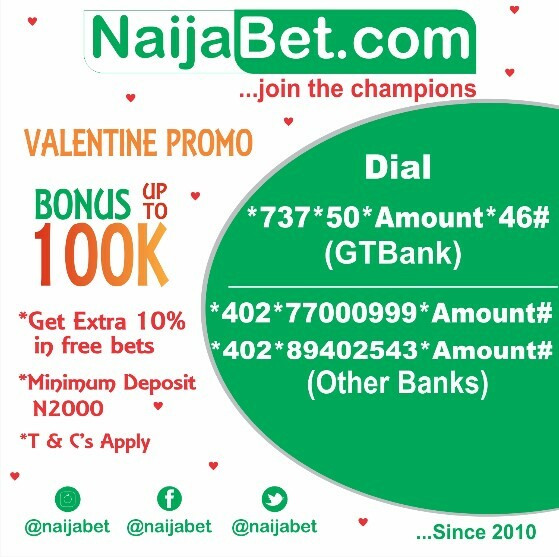 kindly note that the NaijaBet valentine promo is ongoing till 24th of February. Good Day, thank you for contacting us, minimum withdrawal is N500.